Breathe Pilates graduates are in high demand – get the best start to your career by studying with us. At Breathe you’ll experience Australia’s most innovative and recognised Pilates instructor training. Breathe graduates are in high demand from employers in Pilates studios, allied health clinics and fitness settings. Our courses are challenging and rewarding; you’ll graduate as a highly skilled professional. Here are some of the reasons you’ll be glad you studied with Breathe. Learn from teachers who walk the talk. At Breathe you’ll be training with the people who operate Australia’s largest and most popular Pilates studio. We deliver over 150 classes and 200 individual sessions to 1600 clients every week, and each of your instructors has thousands of hours of experience working with clients. You’ll learn an evidence-based approach to Pilates incorporating up-to-date research. You’ll learn current best-practice, not traditional methods. You’ll be learning rigorous anatomy and physiology starting from the very basics and bringing you to a high level of knowledge. We believe your ability to assess clients is only as good as your understanding of anatomy. All our courses are paid by monthly instalments, which will ease the financial burden of study. See individual course descriptions for course prices and payment plans. Further, as a current Breathe Education student you’ll be eligible for a 40% discount on all Breathe Direct Debit memberships for the duration of your studies. Have you ever thought about becoming a pilates instructor? This is an industry with huge growth potential, and working in this field is both financially rewarding and personally satisfying. The matter of how to become a pilates instructor is a complex one. And if you want to know how to become a pilates instructor in Australia, you’d better be prepared for participating in an in-depth course of education. There is a great course for anyone interested in becoming a pilates instructor offered by Breathe Education in Melbourne, Australia. The courses that we offer can be studied purely at Pilates Certificate IV level, or as a combination of Certificate IV and Pilates Diploma level. A sensible blend of practical classroom workshops and online learning, your study would include everything necessary to become qualified as a pilates instructor. These qualifications are accredited under the Australian Qualifications Framework (AQF) and are recognised by both the Pilates Alliance of Australasia (PAA) and Exercise & Sports Science Australia (ESSA). What makes Breathe Education so different from many other course providers is that we really care about helping you to learn. Many schools are primarily about enrolments, and education comes second to that for them. But at Breathe Education, there is a different philosophy at work. Breathe Education is committed to evolving the pilates industry. That’s a lofty aspiration, but the emphasis on quality of education as the foundation of their work has allowed this small school to achieve huge success. Graduates of Breathe Education courses are known throughout the industry as excellent practitioners. This has helped to make Breathe Education a school of choice for anyone considering a career as a pilates instructor. The courses are designed in a way that will allow you to learn with confidence, quickly becoming adept at practical application of pilates methodology, and equipping you with strong teaching and coaching skills. You will gain a thorough understanding of basic anatomy and physiology as these things relate to pilates, and you can use that information in a practical way to perform analysis of a client’s physical state, design fitness programs for clients, and guide your clients safely and confidently toward their fitness goals. Ultimately what Breathe Education is all about is empowering our students to become great practitioners. As a student at Breathe Education, you learn a range of practical skills and those are important, but beyond that you are learning matters of law, ethics, safety, and mentoring. It is an in-depth hands on course that will challenge and motivate you to reaching your full potential. After graduation, you will have your choice of employment or you could even invest in creating your own pilates studio. The most important thing is that you will know that you know what you are doing. You’ll be able to assist your clients safely to achieve their fitness goals. Pilates has become a global phenomenon over the last 20 years and the demand for this exercise method simply continues to grow. When an exercise is as versatile and offers as many physical and mental health benefits as Pilates, it’s easy to understand why the demand is so high. Whether you want to improve strength, concentration, flexibility, endurance or focus, Pilates can offer positive benefits. However, the benefits achieved from Pilates classes really comes down to the quality of the class. As people seek to reap as many benefits as possible from Pilates classes, the demand for the most knowledgeable instructors is high. Could you be the one to lead a superior level of Pilates classes in the Gold Coast area? Whatever your background, with the right training, you could become a true qualified Pilates instructor. What is a “true” Pilates instructor? A “true” Pilates instructor fully understands the biomechanics of Pilates. They understand why and how it affects the body and they have the skills to teach clients how to better their body and mind through Pilates exercises. At Breathe Education, that’s exactly the level of skills and knowledge that we inform our graduates of. We don’t want to just provide our graduates with a qualification. We want graduates to have the skills and knowledge to be able to immediately deliver a truly great standard of Pilates classes. To be the best instructor you can be, we offer the best Pilates instructor course Gold Coast students could possibly avail of. At Breathe Education, you get an opportunity to acquire practical skills and knowledge from some of the best teaching staff in the business. Our graduates are highly sought after, sailing straight into teaching positions in existing studios or even starting their own studios upon graduating. Our course attendees not only graduate with the skills and knowledge to be a true Pilates instructor, but they also graduate with great confidence in their ability to deliver Pilates classes that really empower their clients. Whether you’re a stay-at-home mum who wants a new career or a Pilates fan who wants to make the transition from student to instructor, we’ve got the right training to help you achieve your goals. At Breathe Education, we even have osteopathy and physiotherapy professionals who come to study with us to gain a wider range of tools and experience to enable them to better treat their patients. If you’d like to properly understand the core fundamentals of movement as opposed to just a list of Pilates exercises, then enrolling on the Breathe Education Pilates instructor course is your next step. Start your journey towards becoming a knowledgeable, fully qualified Pilates instructor today. Talk to us about our next enrolment dates for Pilates instructor course in the Gold Coast area. Pilates is one of the most in demand exercise classes in Australia right now. It’s pretty easy to see why. The ability for Pilates exercises to be moderated to suit levels of ability means that it is suitable for a wide range of people, no matter their age or exercise ability. Practising Pilates offers a range of physical and mental health benefits; helping to improve flexibility, concentration and focus, build strength and develop control and endurance in the body and mind. When an exercise system caters to such a wide audience, it comes as no surprise that Pilates classes are often subject to waiting lists. Right now in Adelaide, the demand for Pilates courses are high and there simply are not enough qualified Pilates instructors available to deliver high standard classes. Do you want to lead a high standard Pilates class in Adelaide? Do you want to offer such a high quality class that you have a full group returning week after week? If you want to deliver more than just a couple of floor workouts to your clients, a weekend instructor course simply won’t do. To be the best instructor that you can be, you need to enrol on the best Pilates instructor course Adelaide has to offer. Become a fully qualified Pilates instructor with Australia’s number one instructor course from Breathe Education. Graduates of our Pilates instructor course are highly sought after and tend to sail into employment in fitness studios or even set up their own studios. Why so? At Breathe Education, we equip all students with the practical skills and knowledge to be the best instructor that they can be. We want you to be able to deliver high quality classes and be a true Pilates instructor. We’ll teach you about the biomechanics of Pilates and how and why it affects the body in such a positive way. No matter your education or employment background, we can bring you on a journey to become an outstanding Pilates instructor. With Breathe Education, you can gain a Nationally Recognised Certificate IV in Pilates. This qualification is what you need to get you into teaching classes or it can provide a stepping-stone to studying a Diploma in Clinical Pilates and embarking on a specialist career. You’ll learn from the best teaching staff there is in Adelaide and gain the practical skills and detailed anatomical knowledge you need to start your career as a qualified, respected Pilates instructor. Are you ready to embark on a fulfilling career? Do you want to help clients achieve a healthier body and mind? Speak to Breathe Education today about enrolling for our highly sought after Pilates instructor course in Adelaide. To be the best, you must learn from the best. If you are interested in undertaking pilates training courses, Melbourne offers an ideal location with plenty of courses available at all levels and also a vibrant and interesting city to explore and live in. 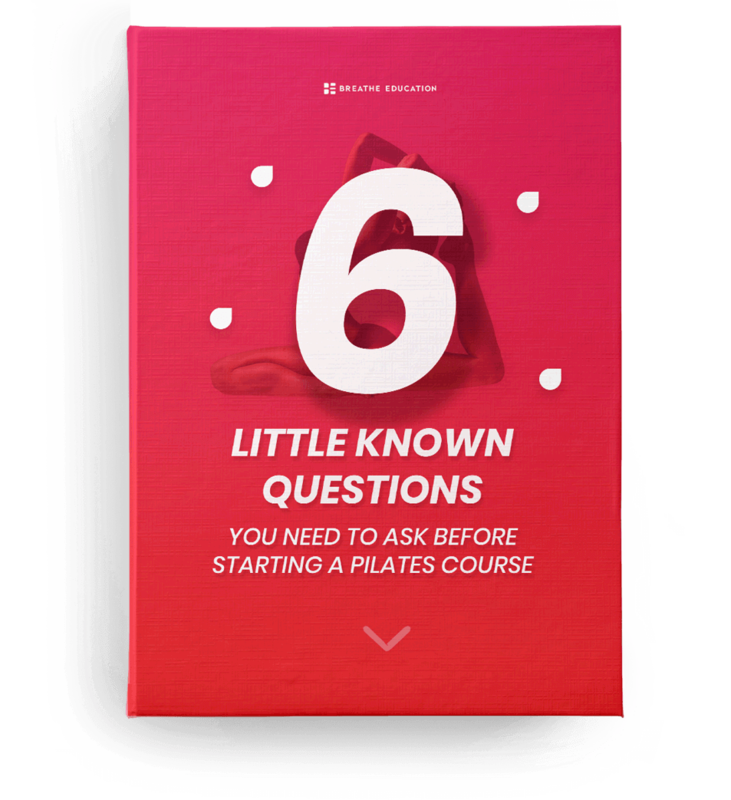 When choosing pilates training courses, you need to consider many factors, including how well suited the course is to your current level of experience and ability. For example, if this is your very first pilates training course, it’s probably not sensible to choose to study at the instructor level, or you’d be quickly left behind. It’s best to start off gradually and learn as much as you can on the practical side before delving into the complex theories and learning how to train others. When it comes to pilates training, Australia is one of the highest rated countries where you could choose to study. With a pilates training certificate from Australia, you know that it will be respected anywhere in the world. This is true because Australia has a long-standing reputation for excellence in training, particularly at the technical education level. There is a system known as the Australian Qualifications Framework that indexes and categorises courses according to the skill level required to successfully pass them. These range all the way from an ordinary school-leaving certificate to the realm of doctorates. Because the system is very logical and easy to understand, Australian graduates are highly sought in technical occupations and trades where high levels of skill are required. Pilates is often viewed as a “new age” fitness system, but actually it was simply a logical system of exercise physiology that developed from a fusion of Eastern and Western exercise forms, combining elements of the systematic exercise regimes used by gymnasts and athletes in Germany during the early 20th century plus elements of yoga. Perhaps the strangest thing about pilates as a “movement” is that it first rose to popularity in a prison camp. Germans were quite obsessed with physical fitness starting from at least as early as the 1880s, and of course this craze had reached a peak by the 1930s when Hitler was stridently promoting physical fitness and health as signs of German superiority. Therefore a wartime prison camp filled with Germans was an ideal petri dish for a new exercise culture to develop. Although while interned in the prison camp Joseph Pilates gave away his methods for free, he very quickly set about publishing them and making money from them. Pilates grew in popularity and it continues to do so today. Learning about pilates is a fun and rewarding endeavour. One of Melbourne’s best pilates training centres is Breathe Education, which offers courses geared towards those seeking a career as a pilates instructor. If you are ready to commence pilates teacher training, Melbourne offers one of Australia’s most respected pilates teacher training courses provided by Breathe Education. Here, you can study a fully accredited TAFE Diploma or Certificate IV course for $575 per month or less. The importance of accreditation can’t be understated. With a valid certificate or diploma level qualification that is endorsed under the Australian Qualifications Framework (AQF), your credentials will be respected worldwide. So if you’ve been wondering how to become a pilates teacher, there’s your answer. Pilates teaching courses are not a cakewalk. You do need to have some grit and determination to successfully complete the course, not least because it is one of the most physically demanding training courses around. That’s only to be expected of course. How could you be expected to train and motivate your own students if you’re not motivated yourself? So courses are typically designed to test your mettle. Of course they’ll also teach you everything you need to know to be a great instructor. You’ll learn to teach pilates, but you’ll also be doing pilates. The best teachers are those who have solid practical experience backed up by a good foundation of theory. Consider also that a good pilates teacher training course doesn’t just teach you about only pilates. It should also involve some understanding of learning theory and how students learn, how they can be motivated, and how you can apply your knowledge in a clinical setting as well. Make the move to a rewarding, meaningful and well-paid career. Pilates is immensely popular throughout Australia and the rest of the world, and there will always be plenty of work available for qualified pilates teachers. Personal fitness coaching and instructor-led fitness sessions are a solid growth industry in Australia at the moment, and the rate of pay on offer is generally very attractive. At the top end of the market, assuming that you later become very experienced and talented, you could end up being a personal pilates instructor to wealthy and famous people, in which case you could name your own price. Of course not everyone is going to achieve that level of success, but it’s always good to keep your options open, and certainly to have your head in the clouds and dream big dreams. Without people willing to do that, nothing worthwhile would ever get done, and the world wouldn’t be half such an interesting place. Those who do dare to dream are likely to make the best teachers, because an indisputable truth is that enthusiasm is contagious. When you can inspire and motivate people to be all they can be, and to go beyond what they think they are capable of, you can then truly consider yourself to be a teacher.